We have had lovely sunshine since mid morning today so when I got back from walking the dogs, I had a quick cuppa and went outside to find a chore to do. I opted for staining the log roll, we have 8 rolls to do - this is to go around the artificial grass but it was so pleasant being outdoor in the garden again that a trip to the garden centre could wait no longer. Your garden centre spending spree has obviously scared the sun away for now! LittleBrownFrog wrote: Your garden centre spending spree has obviously scared the sun away for now! Today I sowed a few early nantes carrot seeds in a trough, I don't mind tiddly carrots , then covered the trough with bubble wralittle wap to keep soil/compost warm while they are germinating. I grow my carrots in containers as I lift them onto the little wall around the patio and it seems to fox the horrible carrot fly. I nipped into the garden centre and got an Ailsa Craig tomato ,and some cut and come again salad leaf seeds. Later I was in ASSSADA and got 4 of the smallish Rhino tubs, I think they are good value at £2 each as they are easy to manage if they need moving for some reason. Though trying to seperate them into the colours I wanted (2 yellow and 2 green) was a laugh, they were stuck fast to each other but a bit of jiggling and a lot of determination later and I got the ones I wanted. I picked up 3 bags of compost too and some bread and milk and dog food. Trouble was, I had only taken one of the small trolleys into the shop and it was a bit overloaded so of course as I was trying to negotiate it across the car park I hit a bump and the bl@@dy lot tipped over. A really helpful young chap and his girl friend helped me to pick up my shopping and loaded the trolley back up and thankfully got it to the car without a repeat. Bet they thought I was a right old fogey wonder if ASSSADA has it on youtube yet ? yesterday, the last day of April, was at last glorious . I couldn't spend the whole day in the garden as other things were demanding my attention too but I did manage to plant my courgettes into the rhino tubs and sit them out in the big cloche . Also sown some runner beans and broad beans and put the tray/pots under the cloche in hope it will be warm enough as the greenhouse is out of commission at the moment . Plus the first lot of salad leaves , some red oak leaf and some green were sprinkled together into a trough for my 1st lot of salad. Some of the toms I bought last week have grown quite a bit so my next job is to sort the next size pots for them and pot them on and possibly the cucumbers too. There will be enough room left in the fruit bed to plant the broad beans as I have only sown about 18, just enough to get a taste in summer. Today I popped into the garden centre on the way home and bought some pea seeds I am going to try them in a big rhino bucket with canes and sturdy net support again it will only be enough to give me a taster but one I will really enjoy. Feeling quite hopeful now and also feeling that this is the amount I can happily manage without it becoming stressful. Just remembered I bought some cress seeds too as I am impatient - so maybe egg and cress sandwiches will be in Ecks sandwich box soon. I said on the daily thread this morning that the weather was sunny and breezy so just right for gutting and washing the greenhouse down. Wish I had kept my mouth shut as an hour later it was overcast and showery , still the inside is free of non gardening stuff now and has had its wash but the outside can wait for a dry day. The courgette plants I put out under the big plastic cloche are doing very well and have put on quite a bit of growth and the trays of bedding plants look fine too . No sign of any of the seeds yet but it has only been a few days, think maybe the broad beans are thinking about it as the compost looks disturbed so maybe they are starting (either that or the cat has got in). The things in the dining room are all doing ok , sweet peas are through and the toms I potted on are ok too. I have a small raised bed that sits just inside the back gate and alongside the fence, it doesn't get much sun so I thought I would use it as a small compost heap instead. I went out to add a bit more veg peeling and to turn it over and was really surprised to see how good it actually is. There is soil and compost as a base as I did try to grow cabbage there last year so no wonder if I could perhaps plant leeks there, anyway I have covered it with a bit of old carpet for now and mull it over. Not fruit or veg but I bought 3 ranunculas at the garden centre yesterday , they are so vibrant, really looking forward to choosing the right pot and seeing them brighten a space up. It seems that some parsnip seeds I sowed last year in the laundry basket are growing as well, it was out of sight and out of mind because I thought the parsnips had finished but maybe I will get a few this year too. 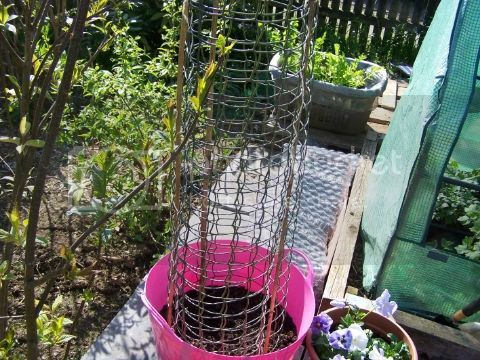 I have sown some peas in a big tub today as well and made a climbing contraption for them from plastic trellis, don't know how well this will work but trying to use my imagination to grow a little bit of my favourite things in just a small space this year. I love those big plastic tubs like your pink one - I have sweet potatoes in some at the moment & am using the other to cart stuff back and forth from the vegetable plot. LittleBrownFrog wrote: I love those big plastic tubs like your pink one - I have sweet potatoes in some at the moment & am using the other to cart stuff back and forth from the vegetable plot. I melt the holes in mine, I have a special screwdriver that I use for the purpose, and the gas hob. I also use it for the bottoms of milk bottles & mushroom boxes. Its near enough the middle of May and I feel if I wait and faff about much longer it won't be worth doing. This afternoon I was in the greenhouse for an hour potting the toms and cucumbers into their final pots, I bought a couple of the giant levington tomato grow bags the other day and so I split them open and used the compost in the coloured tubs I have got for the greenhouse , working on the theory that the stuff in the grow bags must have more benefits than g.p.compost. I can't see any spuds coming through yet but I had a peep in the trough I scattered the carrot seed in and I can just see the start of some wispy bits of green. The plastic cover got lifted over the strawbs and bedding plants and the seed trays of broad beans (not that the beans will be through yet) , thought maybe they should get a bit of the elements during the daytime. Think I will sow a few more carrots tomorrow if I can find another suitable container. When I drew back the curtain this morning just after 6.30 and looked across to the hills I saw they were covered in ice , they are always a good gauge as to the weather but really wished I hadn't looked this morning. Really very cold, quite breezy, one or two sunny intervals interspersed wth heavy rain and sleet - really how are we supposed to hold out any hope of getting garden produce ? Having said that the greenhouse must have retained a bit of heat because the toms, cucumbers and the 2 small planters I have in there still look ok . The peas I put into the big tub have moved and seem to be on the surface now but not sure if its them making natural progress or this heavy rain disturbing them as they are only in compost not soil . Oh please give us some warmth. I couldn't believe the weather forecast for this week - even down in warmer climes here, daytime forecast as low as 9oC and wet ... we've had winters that have been warmer. This past few years, greenhouse and polytunnel growing seems to be the only way forward in case crops on the plot deteriorate.